"It ain't so much the things we don't know that get us into trouble, it's the things we do know that just ain't so." --American humorist Artemus Ward (1834-1867). This quote, often falsely attributed to Mark Twain, is a favorite of Art Shapiro, distinguished professor of evolution and ecology at the University of California, Davis. 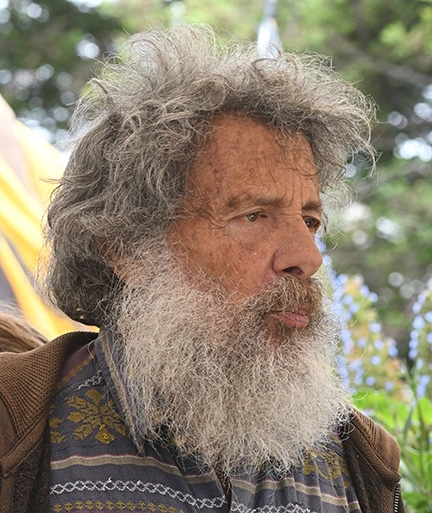 Shapiro has monitored butterfly population trends on a transect across central California for 46 years. The 10 sites stretch from the Sacramento River Delta through the Sacramento Valley and Sierra Nevada mountains to the high desert of the Western Great Basin. Shapiro visits his sites every two weeks "to record what's out." The largest and oldest database in North America, it was recently cited by British conservation biologist Chris Thomas in a worldwide study of insect biomass. "The vast majority of the butterflies we monitor are emerging earlier in the year now than they were in the 1970s," Shapiro said. He mentioned the Red Admiral butterfly, Vanessa atalanta, which spends the winter as an adult, is "our biggest responder to global warming, coming out 21 days earlier on average that it use to, exactly the same in England, same species. It's not weird at all. It is winter active." His research shows that not only are butterflies coming out earlier, but "we also find trends in population and species richness." 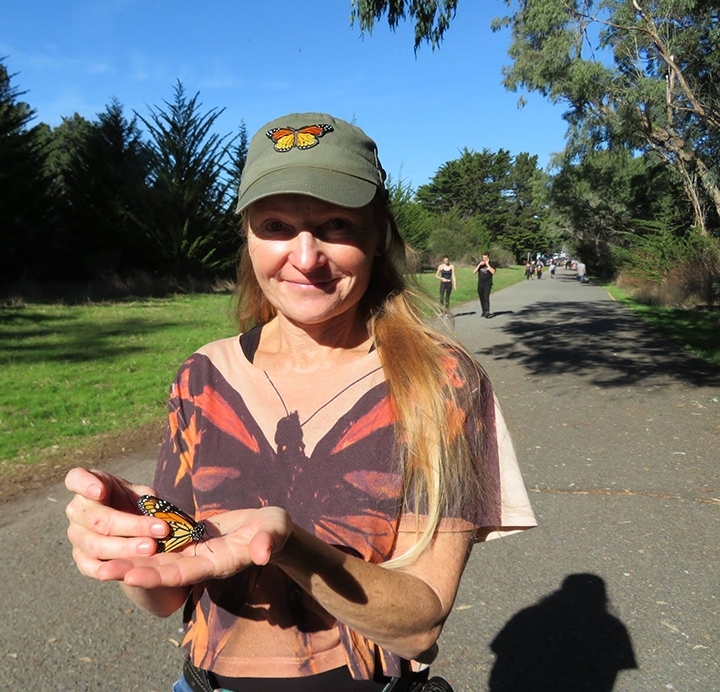 Shapiro, a member of the UC Davis faculty since 1971 and author of the book, Field Guide to Butterflies of the San Francisco Bay Area and Sacramento Valley Regions, said that "in a nutshell, at low elevations, butterfly faunas have been declining slowly until 1999. In 1999, 17 species had an abrupt fall in abundance, spontaneously. On its face, this was a non-random event. The decline was then rapid from 1999 to the onset of the recent drought and then things went up again." 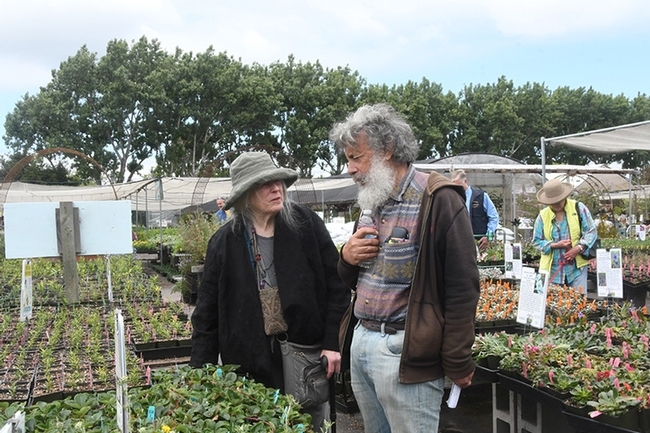 "Things rebounded during the drought," the professor said. "We began getting better data both in terms of numbers of species and abundances. A blast from the past...When the drought ended, we had a very wet year two years ago, and now things are sliding down again. What is going on, ladies and gentlemen? What is going on?" Shapiro noted that by and large, immature butterflies spend the winter underground or right at the surface. "This is the worst possible environment for overwintering butterflies in the early stages, what with the combination of warm and wet." The high humidity and temperature are very favorable for fungal and bacterial pathogens, he said, adding that "Overwintering survival in warm wet conditions is poor." "When we have a dry winter, it's colder at night but not cold enough to be lethal, he said. "It's a healthier environment to be an overwintering caterpillar. That's what we think is going on." In the mountains or higher elevations, changes are strongly correlated with climate. "As it gets too warm and dry down below, butterflies are moving uphill, but plant resources are moving up the slope more slowly. When resources are not available yet higher up, butterflies have a real problem. There's no where to go at all for truly alpine species; they're already at the top of the mountain. The next stop is heaven." Shapiro described the decline of butterfly populations in the mountains as "worrisome." 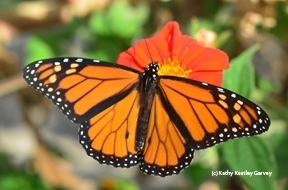 Neonicotinoids, which Shapiro defined as "a class of synthetic pesticides chemically derived from the chemistry of nicotine," are often targeted as a cause of butterfly decline. "Neonics are not in Scotland and there's been no butterfly decline in Scotland," he pointed out. "But, anyone who has taken a statistics course knows that Correlation Is Not Causation." 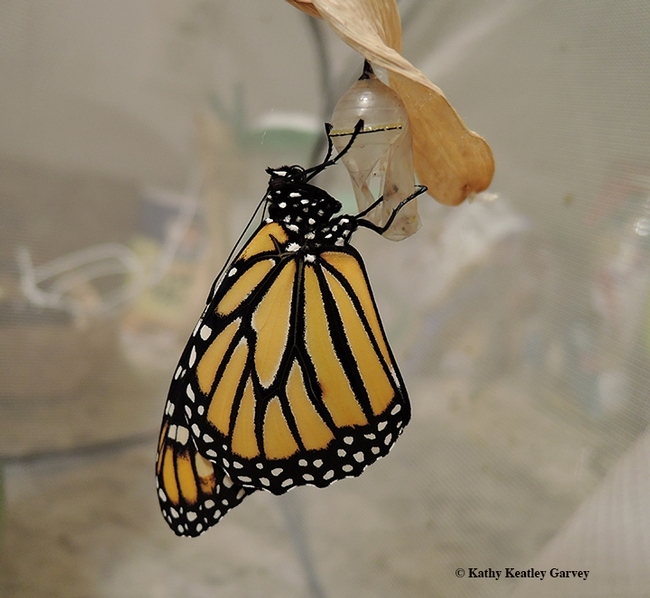 Turning to monarchs, Shapiro said "More than half of the questions I get from the public deal with monarchs." Describing the monarch as "the poster child for conservation," Shapiro said: "There's a lot of stuff out there in the media, and it's not all to be believed." Butterfly population counts differ from summer breeding data and the overwintering data. 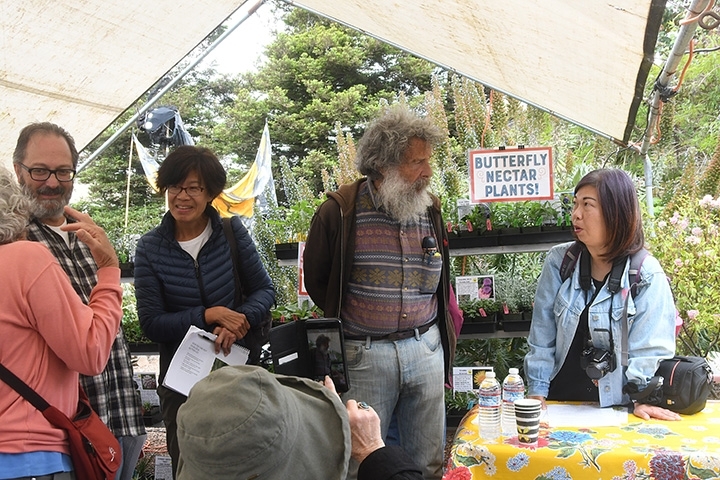 "If you want the scoop on monarchs--unconnected with fundraising or politics," he said, "read Anurag Agrawal's book, Monarchs and Milkweed." The book is subtitled "A Migrating Butterfly, a Poisonous Plant and their Remarkable Story of Coevolution." Agrawal, the James A. Perkins Professor of Environmental Science at Cornell University, Ithaca, N.Y., received his doctorate in population biology from UC Davis in 1999. "Monarchs in California have had a long decline, perhaps more dramatic than the decline in the Midwest and the East," Shapiro said, adding they have never been as common in California than they are in the East. "If they're relatively scare, that doesn't mean a decrease. We need to do comparisons over time. During the drought, they came back. We don't know why." Shapiro also said that monarchs are winter-breeding in California, something they didn't do 10 years ago. "It started in southern California, maybe a decade ago and is now spreading to the inland empire. They're well established in the East and South Bay." He said he heard one report of monarchs winter-breeding in Woodland, Yolo County. 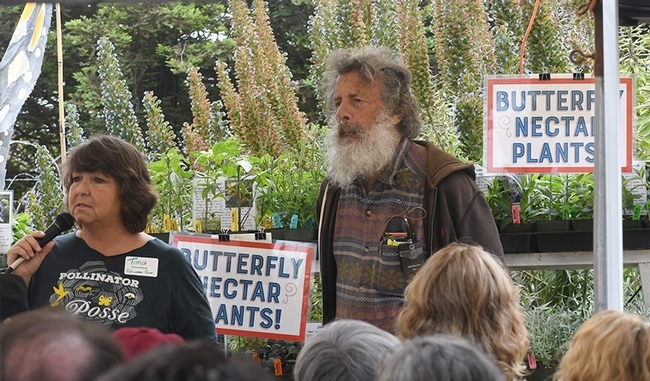 "Monarchs can't breed in the winter here under natural conditions," Shapiro said. "A non-native, non-dormant milkweed, tropical milkweed (Asclepias curassavica) allows winter breeding. These plants are often contaminated with the parasite, Ophryocystis elektroscirrha or OE, a problem in Southern California, but not yet in northern California. "People who are really committed to native plants would like you to get rid of your exotic tropical milkweed and replace it with native species that go dormant." He recommends "cutting them back three times a year" to allow fresh new growth. Butterfly faunas are declining in most parts of the North Temperate Zone where monitoring is done. The most severe declines have been in European grassland faunas. By those standards, we're not that bad off (yet?). At low elevations in California, declines were moderate until 1999, when they accelerated abruptly. Our multivariate statistical analyses suggest (but cannot prove!) 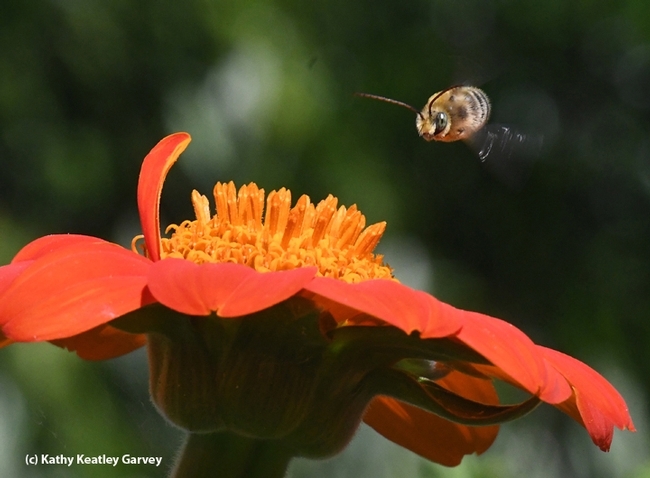 that climate change has been only a minor factor, while habitat conversion and loss, and loss of habitat connectivity share the blame equally with pesticides, specifically neonicotinoids. 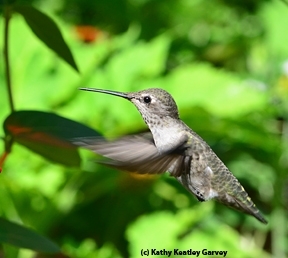 At higher elevations in the Sierra Nevada, species at tree-line have declined in response to climate change but there have been no losses attributable to habitat conversion or pesticides. Many species are moving upslope (or trying to, because they are more mobile than their essential plant resources). The recent “1000-year drought” had dramatic impacts. At low elevations, butterfly faunas rebounded from recent lows, probably due to a better environment for overwinter survival. In the mountains the opposite happened: lack of snow cover led to poor overwinter survival and faunas plummeted to unprecedented lows at places like Donner Summit. The heavy snow pack of winter 2016-17 did little to improve things, because the number of animals going into overwintering was already so low. We are already seeing low-elevation faunas slipping back into decline. Because most montane butterflies have only one generation a year, it will take several favorable years to rebound from the losses there. Our research revealed that California monarch populations had been in decline for decades, perhaps more so than in the East and Midwest. This was true even though the usual “suspect” causes – GMOs and milkweed shortages – do NOT appear to apply here. 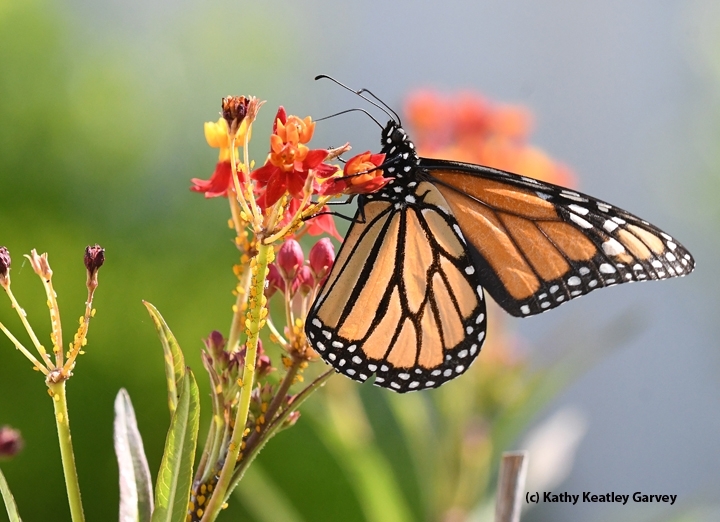 There was also a change in the seasonal breeding pattern of monarchs during the worst of the decline. During the drought, monarch populations rebounded significantly here, and their historic seasonal breeding pattern returned. But this year we seem to be going back to pre-drought patterns. 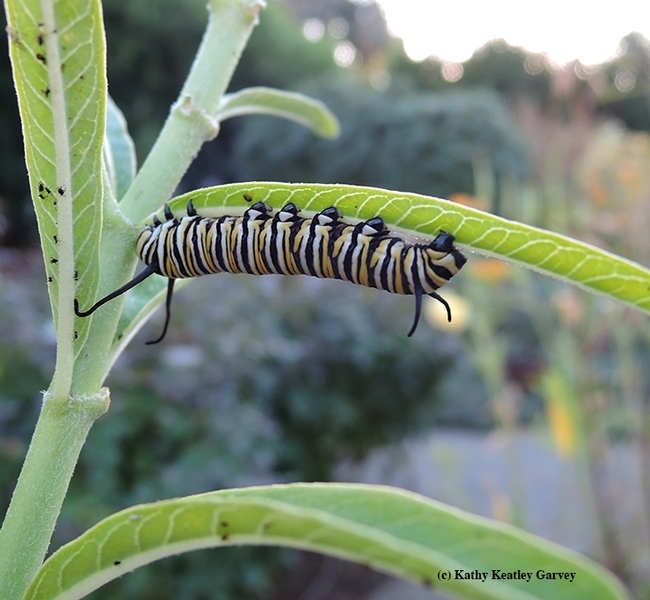 Winter breeding by monarchs began in Southern California several years ago and has now spread to the Bay Area. Overwintering monarchs are supposed to be in reproductive diapause cued mainly by daylength. Why a growing percentage of them are not is a mystery which has not been solved as of this afternoon. Congratulations to community ecologist Louie Yang of the UC Davis Department of Entomology and Nematology, the newly announced recipient of an international award for his outstanding academic advising activities. What an honor and so well-deserved! Yang will receive the Outstanding Faculty Academic Advising Award from NACADA, also known as the Global Community for Academic Advising, at its Sept. 30-Oct. 3 conference in Phoenix, Ariz. He earlier received the 2017 Faculty Advisor Award of Excellence in NACADA's Pacific Region 9, comprised of California, Nevada and Hawaii. 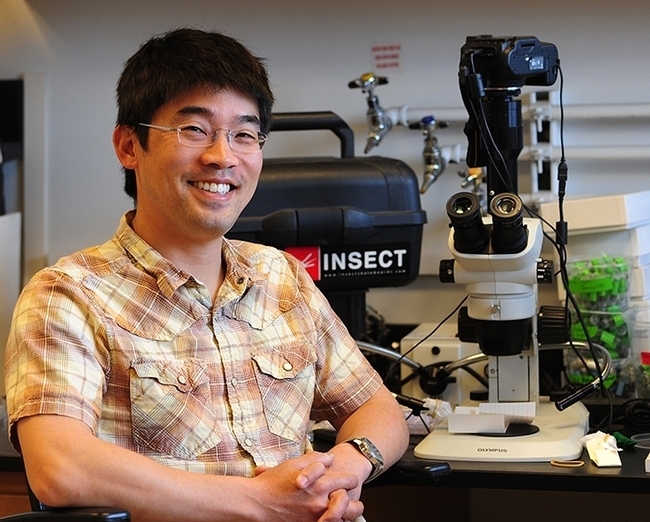 Yang, an associate professor who joined the UC Davis faculty in 2009, teaches Insect Ecology and Field Ecology. He holds a bachelor's degree (ecology and evolution) from Cornell University, 1999 and received his doctorate from UC Davis in 2006. He is known for fostering creative and critical thinking, and challenging his students to succeed by linking their academic studies to research and other goals. “His mentees not only include undergraduate and graduate students, but high school students and postdoctoral scholars and beyond,” Nadler said. “He attends to the unique needs and interests of each student, respecting their perspectives and ideas. Mentorship, he finds, is really about helping students identify the questions that they want to ask. His success is their success." An important part of his advising is his work in the Research Scholars Program in Insect Biology (RSPIB), a campuswide program co-founded by Jay Rosenheim, Joanna Chiu and Yang. Aware that some of the most important skills for research biologists cannot be taught in big lecture halls or even in lab courses, they set out to help students learn cutting-edge research through close mentoring relationships with faculty. The program crosses numerous biological fields, including population biology; behavior and ecology; biodiversity and evolutionary ecology; agroecology; genetics and molecular biology; biochemistry and physiology; entomology; and cell biology. The goal? To provide academically strong and highly motivated undergraduates with a multi-year research experience that cultivates skills that will prepare them for a career in biological research. 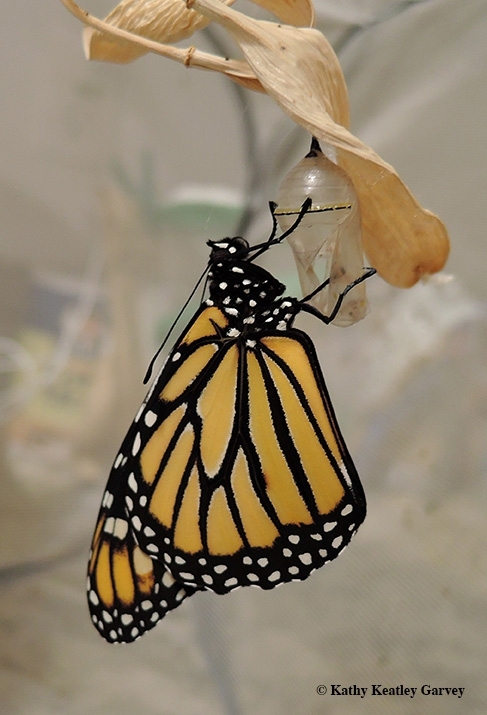 In the past year, Yang mentored 15 undergrads in his lab in studies that included: the nonconsumptive effects on monarch development to see if parasitoid avoidance behaviors in early development have a long-term cost for monarch development; the factors that contribute to herbivory by generalist herbivores on milkweed; the effects of a recently observed plant foliar fungal pathogen on milkweed on monarch growth and development; the costs of switching milkweed species for monarch larvae; and the density dependence in larval and adult blue milkweed beetles. Former student Allyson Earl, now a researcher in Guam, credits Yang with shaping her academic career: "I had the pleasure of working under Louie Yang for the last year of my undergraduate degree at UC Davis as one of his research assistants. I watched as he worked tirelessly with several other student assistants in the lab on personal projects focused on our study subjects, Monarch butterflies. His mentorship style in these projects was one that guided students to draw their own conclusions rather than handing them answers, leading them to ask more complex questions and develop themselves as better students and scientists. I can say with confidence, he not only nurtured my desire to study the intricacies of ecology, but also to pursue a career in this field, without his guidance and support I would not be where I am today." Yang also launched the Monitoring Milkweed-Monarch Interactions for Learning and Conservation (MMMILC) Project in 2013 for high school students in the environmental science program at Davis Senior High School or those associated with the Center for Land-Based Learning's GreenCorps program. They monitor milkweed-monarch interactions in a project funded by the National Science Foundation. Yang and UC Davis undergraduate and graduate students serve as mentors. Established in 1983, the NACADA Annual Awards Program for Academic Advising honors individuals and institutions making significant contributions to the improvement of academic advising within higher education. Its membership totals more than 11,000. So you're trying to rear monarch butterflies. 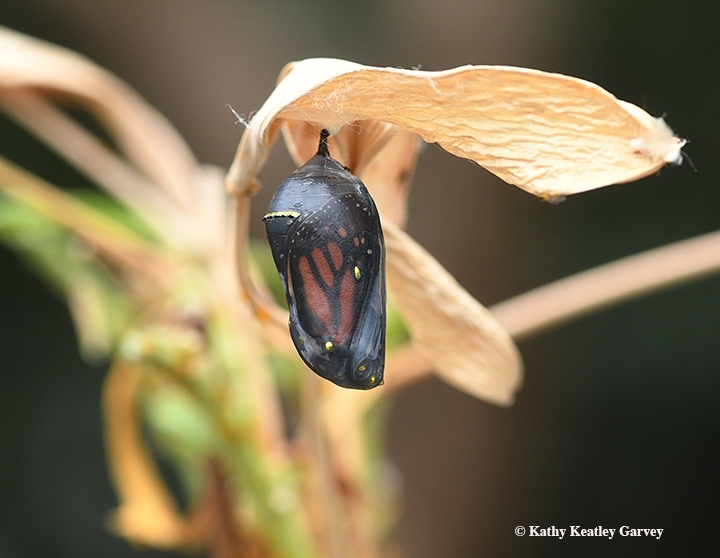 You notice an egg on your milkweed plant, and watch its life cycle from egg to caterpillar to chrysalis. Aha, you think, soon I'll be able to see an adult monarch eclose from that chrysalis. 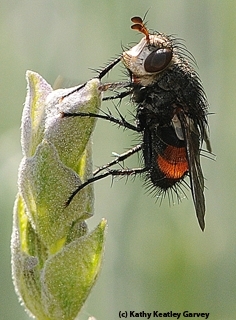 If a tachinid fly lays eggs in that caterpillar or chrysalis, you'll get several tachinid flies, not a monarch. 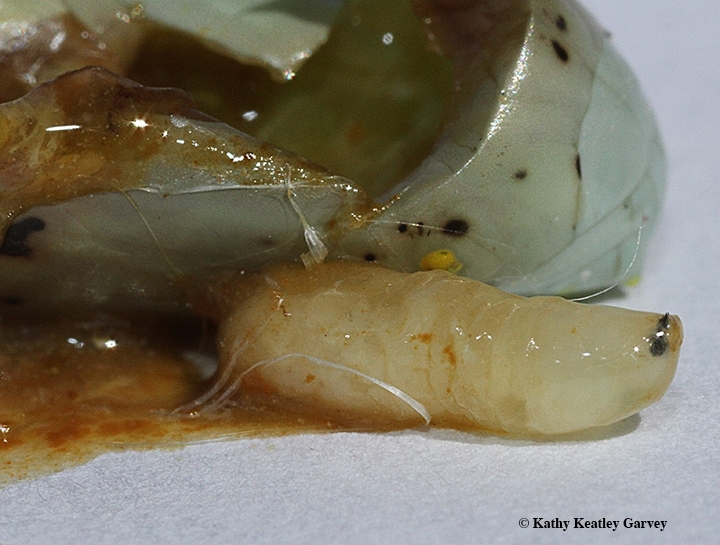 The fly larvae will eat the host--the caterpillar or chrysalis--from the inside out. The tachinid fly is a parasitoid, and you can learn all about this parasitoid and many others at the Bohart Museum of Entomology's open house, Parasitoid Palooza, set from 1 to 4 p.m., Saturday, Nov. 18 in Room 1124 of the Academic Surge Building, UC Davis campus. It's free and open to the public and family friendly. A family craft activity is planned. "An insect parasitoid is a species whose immatures live off of an insect host, often eating it from the inside out," said Tabatha Yang, education and outreach coordinator of the Bohart Museum of Entomology. "It is part of their life cycle and the host generally dies." Bohart Museum senior museum scientist Steve Heydon, a world authority on Pteromalids, or jewel wasps, a group of tiny parasitoids. Entomology PhD student Jessica Gillung who researches the Acroceridae family "a remarkable group of endoparasitoids of spiders." 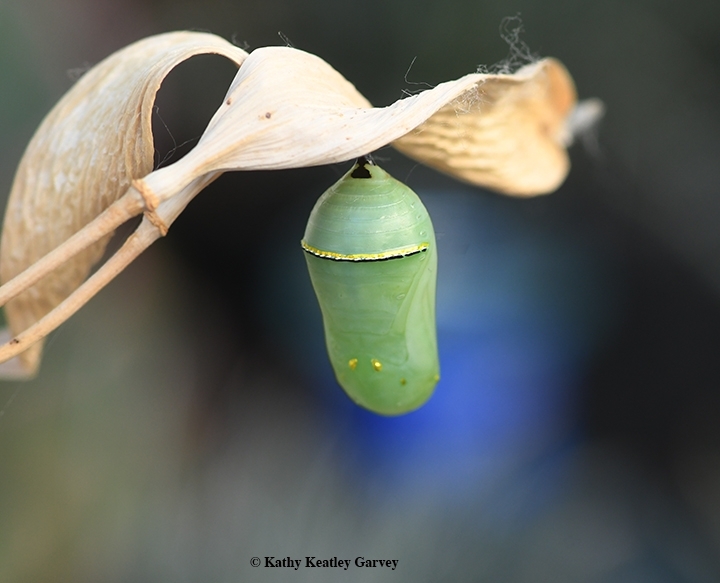 Family craft activity is a pop-up card, featuring a monarch chrysalis and a fly, suitable for mailing to friends and family during the holiday season. There are some 3,450 described species of Pteromalids, found throughout the world and in virtually all habitats. Many are important as biological control agents. Members of the Acroceridae are "rare and elusive flies lay the eggs on the ground or vegetation, and the little larva is in charge of finding itself a suitable host," Gillung said. "Upon finding the host, the larva enters its body and feeds inside until it's mature to come outside and pupate. They eat everything from the spider; nothing is wasted." Her dissertation involves "the evolution and systematics of Acroceridae, focusing on understanding host usage patterns and trends in morphological variation." Tachinid flies, which lay their eggs in caterpillars and chrysalids, will be on display, along with the remains of its hosts. It is used as a biological control agent for some pests. 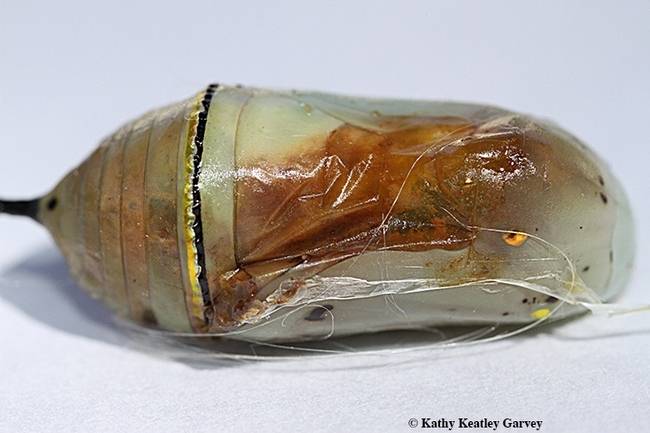 But those who rear monarch butterflies consider it their enemy when it lays eggs in their caterpillars and chrysalids. The late UC Davis entomologist Richard M. Bohart (1913-2007) researched Strepsiptera, or twisted-wing parasites, for his doctorate in 1938. Both the Bohart Museum and an entire family of Strepsiptera, the Bohartillidae, are named in honor of Professor Bohart. The Bohart Museum, directed by Lynn Kimsey, professor of entomology at UC Davis, houses a global collection of nearly eight million specimens. It is also the home of the seventh largest insect collection in North America, and the California Insect Survey, a storehouse of the insect biodiversity. Special attractions include a “live” petting zoo, featuring Madagascar hissing cockroaches, walking sticks, praying mantids and tarantulas. Visitors are invited to hold some of the insects and photograph them. The museum's gift shop, open year around, includes T-shirts, sweatshirts, books, jewelry, posters, insect-collecting equipment and insect-themed candy. More information on the Bohart Museum is available by contacting (530) 752-0493 or emailing bmuseum@ucdavis.edu or Tabatha Yang at tabyang@ucdavis.edu. Horticulture experts at the UC Davis Arboretum and Public Garden will join forces with the Yolo County Master Gardeners on Sunday, Sept. 24 to present a free workshop on "Pollinator Gardening." The event takes place from 10 a.m. to noon in the Arboretum Teaching Nursery on Garrod Drive, UC Davis campus. They'll tell you how to enrich your environment with bees, butterflies, hummingbirds and other pollinators. It's a great opportunity to immerse yourself in the beauty of nature. It's about the passion, persistence and poetry of nature. 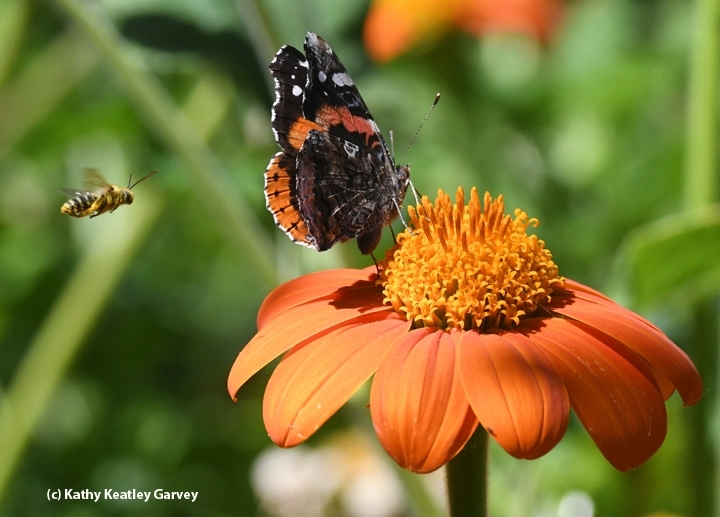 It's exciting to see how many pollinators visit--or reside in--your garden. Plant 'em and they will come! It's indeed challenging, but highly rewarding to capture images of the pollinators (see below). It's also highly addictive.